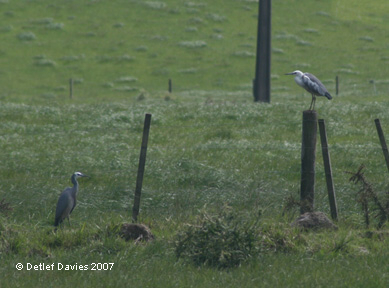 On 20/10/07 Detlef Davies reported the finding of a white-necked heron near Pakaraka, in the Far North, on BIRDING-NZ. 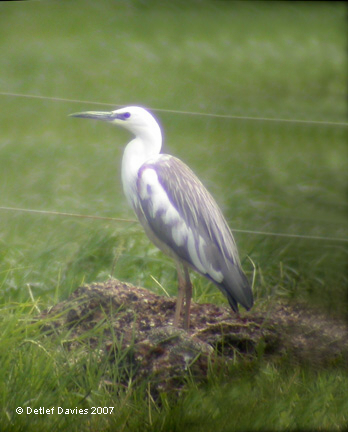 This bird had been found on the previous day by Ray Pierce, feeding in paddocks beside State Highway 1. On 22/10/07 Tim Barnard made a mad dash from Rotorua to ‘twitch’ the bird, and managed to find it near to where it had first been reported. He managed to get close views of the bird, and realised that it wasn’t a white-necked heron, but was actually a partial albino white-faced heron. 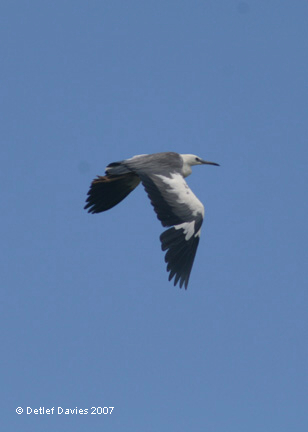 This bird, as can be seen from the photos below, has the characteristic white head and neck of a white-necked heron, but as indicated in the centre photo is the same size as an accompanying white-faced. Certainly a very strange bird. Photos taken by Detlef Davies. These photos are copyrighted and permission must be given to copy or use them in any form.